Christopher Anton Rea (pronounced Ree-ah), born 4 March 1951, is a singer, songwriter, and guitarist from Middlesbrough, England. He started his music career in 1978. Rea's initial focus was on continental Europe, releasing eight albums in the 1980s. It wasn't until 1985's Shamrock Diaries and the songs "Stainsby Girls" and "Josephine," that UK audiences began to take notice of him. Follow up albums On The Beach and Dancing With Strangers became UK hits and then the New Light Through Old Windows compilation album in 1988 cemented his reputation. His next full album was to be his major breakthrough: The Road to Hell (1989) enjoyed massive success and became his first number one album in the UK. These successes could not be mirrored in the U.S., however, where it failed to chart. The follow-up album, Auberge, also enjoyed massive European success, reaching the top spot in the UK. After Auberge After 'Auberge' Chris Rea released 'God's Great Banana Skin' which managed to reach Number 4 in the UK. The album returned Rea to the rockier sound of 'Road To Hell' and the single 'Nothing To Fear' gave him another Top 20 hit. A year later 'Espresso Logic' hit the Top 10 and 'Julia', written about his second daughter, gave him his 11th Top 40. A period of ill health meant his next album did not appear until 1998. Despite no singles being released and little promotion, 'The Blue Cafe' still made the UK Top 10. However it proved to be Rea's last. In 1999, 10 years after 'Road To Hell' Rea released 'Road To Hell' Part 2. Many felt Rea had begun to lose his way, the album received no promotion and as a result never made the Top 40. However it didn't get Rea down and in 2000 he released 'King Of The Beach', receiving critical praise and a healthy Top 30 placing. In 2000 a remix of Rea's 1986 On The Beach single by York was released and enjoyed moderate dancefloor success. Fighting cancer and back to the blues Following a severe bout of cancer, and a predicted 50% chance of survival after an operation, Rea promised himself that if he recovered, he would return to his blues roots. This is what he did in 2002, releasing the album Dancing Down The Stony Road following recording sessions in France and the UK. (An abridged version of the album was later released with the title Stony Road.) The album was followed by a DVD of the same name, comprising a "Making Of" documentary and footage from a concert in Cologne. Rea set up his own JazzeeBlue label in 2003 to free himself from the pressure of record companies and their expectations. Since then he has released the blues albums Blue Street (Five Guitars) (a jazz-blues album, almost fully instrumental), Hofner Blue Notes (fully instrumental) and the The Blue Jukebox (another jazz-blues influenced album released to critical acclaim). He has recently worked with David Knopfler for two albums, Wishbones (2001) and Ship of Dreams (2004). It is also known that it is Chris Rea who clicks his fingers on Queen's track "It's a Kind of Magic". Chris is a supporter of charity organizations and a master painter. 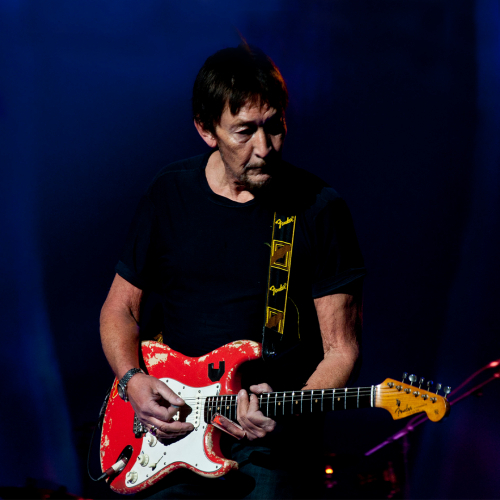 Blue Guitars Chris Rea released his final box-set album, "Blue Guitars" in 2005. Consisting of 11 CD's and 1 DVD (Dancing Down The Stony Road), the album is Rea's testament to blues. Each album contains specific songs of the blues genre, and all have been newly recorded and released. The box-set includes colourful paintings by Rea. This album closes the final chapter of Chris Rea's solo career and he does not intend to make any further solo records. He has stated that he will continue to make records with some of his favorite players under the name "The Memphis Fireflies". However, the plans had changed, obviously. Anyway, the album sold enough copies to have topped the charts in the single CD category The Road to Hell and Back In 2006, Chris Rea embarked on a full Europe and UK tour, after which a CD/DVD "The Road to Hell and Back" was released, the only live album by Chris Rea up to date. The Return of the Fabulous Hofner Bluenotes Seeing that the Blue Guitars ear book sold well enough, Chris Rea released another audio book in 2008, called "The Return of the Fabulous Honfer Blue Notes". The story of a late fifties guitar instrumental band (The Delmonts) that evolved into a 60’s blues band (The Hofner Blue Notes). The musical book comprises 80 pages, vinyl records and three CD’s. Chris believes with a passion that the new download market is opening up a new door for more thoughtful and substantial quality product. If you live and breathe music and not necessarily showbiz, track downloading is simply not enough. Plans In some interviews, Chris said that he's working on two brand new audio books, 'On The Beach' (beach culture) and 'The Last Open Road' (street culture), both will be probably released within the next two or three years. Film As can be seen at IMDB Rea has also dabbled seriously in film, playing lead in the 1999 comedy "Parting Shots" opposite such notables as John Cleese, Bob Hoskins and Joanna Lumley. Somewhat ironically, Rea plays a man who's told cancer gives him six weeks to live, and decides to kill off the people who've done him wrong in life.